The way that airlines transport live animals has not changed much since the early days of commercial air travel in the first half of the 20th century. However, the number of animals transported has grown tremendously. The Department of Transportation notes, “Over two million pets and other live animals are transported by air every year in the United States.” Animals transported via air can be exposed to drastic changes in temperature and humidity from the holding area to ground transport, and on board the plane. IoT technology provides a better way to monitor them from departure to arrival. A federal law called the Animal Welfare Act establishes requirements for the conditions of animal transport, including animal ages, temperatures and care. For example, airlines generally do not accept animals for cargo or baggage transport if the outside temperature is too hot or too cold. While the cargo hold where pets are transported is climate controlled, it is uncommon for airport pre-loading areas to have heat or air conditioning. Airlines have also begun to establish their own rules on certain types or breeds of animals they will carry after a few highly publicized incidents. These restrictions indicate how difficult it can be to transport a pet or animal by air. In the past, there was only way to monitor pets’ location and health in the skies. It was simply the reliance on the chain of custody processes and people. These custodians check cargo in and out of their areas that result in a record of locations and possibly the environmental condition(s) at the time. However, the report is rarely in real-time or accessible by outside parties, such as the owners. 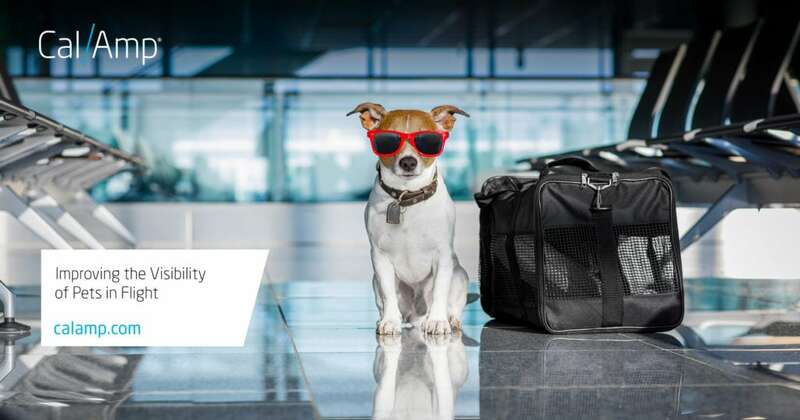 Unfortunately, as with regular luggage and general cargo, pets are overlooked for any number of reasons – the airport is a hectic place. An efficient way to resolve this problem is with smart technology: something that could stay with the pet during the entire flight, track location and environmental conditions. A smart sensor tag attached to a kennel or crate logs data on location, temperature, humidity, shock, light and vibration. The information transmits via a smart device to a cloud-based platform to provide a real-time picture of the animal’s position and the current conditions. Additionally, if environmental conditions exceed pre-set thresholds, alerts notify the airline and pet owner(s) to take action. This solution exists today. CargoSense’s new MavenPT app powered by CalAmp’s smart sensor technology provides location throughout the journey, while the environmental conditions are available in real time prior to flight departure, stored while in flight and then automatically downloaded to the app and viewable upon arrival.. The Maven pet tracking solution is available from local veterinarians or directly from CargoSense. This IoT technology advancement offers pet owners, dog clubs, veterinarians and airlines some peace of mind whenever their pet or animal flies. To learn more about the partnership between CalAmp and CargoSense, read the press release here. For more on CalAmp’s supply chain visibility solutions, visit our page here.